Supporting addressable referencing and linking of musical notation based on semantic context. This demonstrator explores the use of DMOs as inputs to music performance (including live) and as carriers of notation examples to enrich the consumption experience, by supporting addressable referencing, linking, and dynamic, real-time manipulation of musical notation based on multi-user interactions and semantic context. Such concepts transcend the symbolic representation of the music being played, and reference significant context that can be captured or supplemented by metadata from related material (e.g. about the artist, or a particular style, or the music structure). For instance, during a jam session, a participant might signal to the other players a new piece that he or she wished the group to transition to; or reference a particular prior recording or artist they wished the group to emulate in style or interpretation; or call out direction to shape the structural elements of the performance, such as to repeat a chorus or verse, or move to a bridge section. This demonstrator supports the dynamic rendering of MEI, modified according to the corresponding ramifications for the musical score, to the individual performers (e.g. to modify articulation in a passage; or repeat or jump to a different section). 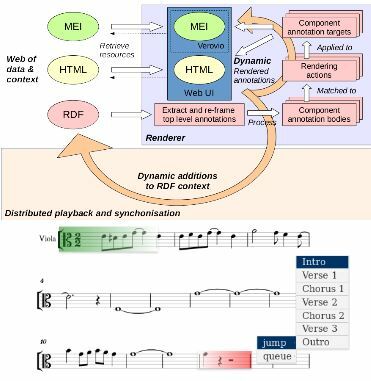 Further, by adopting MEI’s support for linking and referencing using a Linked Data approach, we explore semantic hyperlinking to and from the musical notation. This enables matching and linking of sections of score as examples in external sources, illustrating interpretations and analyses, and situating the examples back in context. K. R. Page, D. Weigl, D. Lewis, & C. Rindfleisch. 2016. Prototypical scenarios for contextual navigation with MEI and Linked Data. Accepted to Music Encoding Conference (MEC 2016). Montreal, QC, Canada.